SiteLock LLC, a global provider of website security technology and products for online businesses, has experienced exponential growth during first half of 2012. The company has established more than 100 new relationships with hosting partners, resellers and other providers in the Internet space that serve the small and midsize business market. SiteLock added many of these partners during their presence at HostingCon last week, where they were an event sponsor and exhibitor. SiteLock organizes partnerships through a SECURE Partner Program in an effort to help website hosting companies and ancillary providers gain a new revenue stream and keep their customers safe by offering low-cost, comprehensive scanning and monitoring solutions. As of July 2012, SiteLock has already secured more than 100 new partners, many of whom join the program through wholesale providers such as OpenSRS and eNom. Additionally, hosting industry giants including HostGator, Lycos, Aruba.it, UK2 Group, and related providers, Attracta and BaseKit, are examples of the company’s impressive global expansion in the website security market. Through the growing number of resellers that SiteLock is acquiring, the company is realizing an increased amount of exposure that is rapidly growing the company’s customer base, both organically as well as through channel partnerships. SiteLock now protects more than 600,000 websites, covering 6 million web pages, around the world on a daily basis and is onboarding more than 40,000 new customers each month. To effectively serve global and mobile markets, the SiteLock dashboard is now available in multiple languages including English, French, German, Italian, Spanish, Dutch and Portuguese-Brazilian and also through its new mobile application to keep website owners connected while on the go. SiteLock also just released their new SMART (Secure Malware Alert and Removal Tool) technology that includes an enhanced scan that evaluates websites from the inside-out, as well as the outside-in, and can remove malware automatically. In addition, the company recently announced the availability of PCI compliance for businesses that accept credit cards at retail locations and/or through their websites. 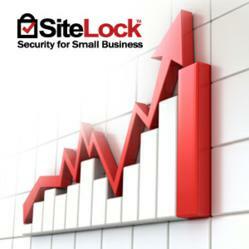 For additional information about SiteLock website security technology and services, visit http://www.sitelock.com.